Remember our blog, B2B Social Media: Branding and Business Targeting? In many ways, this was an “I told you that story so I could tell you this one.” While that blog focused on the basics, such as tailoring your website and voice to reach your B2B industries on social media, as well as how to use social media to target the individuals in your target industries, this blog looks at what you need to do to thrive on the various social media platforms. This article is going to focus on the big 4: Facebook, Twitter, Instagram, and LinkedIn. If you’re interested in advice for other social media platforms, let us know in the comments. “But heroic content creator,” I hear you ask. “Why do we need to pick or adapt to multiple platforms when we can just post the same content to each?” Well, you certainly can, and it will be faster than working out original posts and content for each, but as you know “faster” and “more effective” rarely go hand-in-hand when it comes to copying content. If you’re just looking at building backlinks, sure, you could do worse. 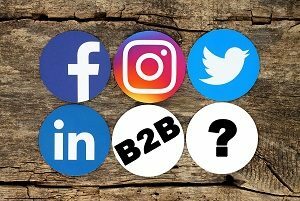 But if you want to reach out and engage your B2B individuals on their preferred social media platform, you need to focus on keeping your message consistent, not verbatim. When you’re looking at the various social media platforms (we’re focusing on the big four), you’ve got four major factors to consider for maximizing your return and being ready for the platform. Where Your Target Industries Live: Different industries thrive on different social media platforms. While you should investigate each business (and their key individuals) for their personal activity, there are some generalities that can help narrow the search. What Content You’ll Need: Different platforms have different requirements. These aren’t the hard requirements of photo size or character length, but what you’ll need to match the unspoken standards of each platform. Platform Strengths: All of these platforms have carved out their own niches in the social media landscape. When their strengths align with that of your company or your target companies, they make ideal platforms. Type of Engagement: Lastly, engagement (communication between you and others on the platform) tends to differ on each of these platforms, from interactions on the post, direct messaging, and follow/connect mechanics. Below you will find specific tips and tricks for each platform. While I’m handling Twitter and LinkedIn, our own very talented social media specialist Jordan Dunne is tackling Facebook and Instagram. The king (or queen) of social media, Facebook boasts the largest user base, a great advertising platform, and a fairly easy interface for businesses. For many businesses, Facebook is their first platform for engagement, even when it comes to B2B. Where Your Target Industries Live: Businesses and individuals alike thrive on Facebook as the most widely used social media platform, with 2.23 billion active monthly users. What Content You’ll Need: Personality works best on this platform, especially with the use of images and video (we recommend professional photography, stock imagery, and custom graphics). Facebook Live is an opportunity to engage with your target audience in real time, should you choose to use it. Platform Strengths: Versatility and reach. The possibilities for content to be shared is almost limitless, and the analytics and ad targeting can show you what’s performing well and what isn’t. Drive traffic to your page to engage or your website to get traffic. Type of Engagement: Outside of posting content regularly, a business’ role for engagement on Facebook is more passive. Respond to those who comment on your content or leave a recommendation (good or bad) about your business. Where Your Target Industries Live: Next to Facebook, Twitter is probably the next most active social media platform for most businesses, both for their business pages and individual employees. This is especially true in industries that focus on news and events. What Content You’ll Need: The best content for Twitter is that of a timely nature (events, awards, etc.) and that are relevant to trending hashtags, such as having a booth at an expo. Platform Strengths: Twitter’s popularization of the hashtag makes using those a potent tool. Monitor and use relevant hashtags, but don’t go crazy with them. Type of Engagement: Use the “@username” function to directly talk to specific targets. Look out for target clients and make sure to follow them. Also check your notifications regularly and see who follows you: if you like their content or think they may be a possible B2B client, follow them back and engage. Pretty pictures, memes, short and sweet captions… you may not think that B2B has a place on Instagram, but done right, this platform can make your business seem more relatable to the people behind the companies you’re targeting. Where Your Target Industries Live: Instagram is the platform to use when you want to reach the people behind the companies you are targeting. Don’t try to sell, try to show your brand’s personality (and the own people behind your company). What Content You’ll Need: Most people are (sometimes mindlessly) scrolling through Instagram throughout the day, so you want content that will stand out from the rest and make people pause to notice your content. And don’t forget about the Stories feature – post in real time fun and engaging content that shows your brand’s personality. Platform Strengths: Just like Twitter, hashtags are a powerful tool for helping you reach your target audience, although they are a little more obscure. Do your research on what works for your specific targets and for your business, tag your location, and engage with other users’ images. Type of Engagement: Create a set of hashtags that are relevant to your business and use them to your advantage. Search by those hashtags and like/comment on images from other users using them. The same goes for your target locations. Just like Twitter and Facebook, check your notifications and respond to comments. LinkedIn is sometimes the odd one out when it comes to social media platforms, with many seeing it as simply a place to keep their resume. However, if you’ve got the right engagement and a sales team that’s willing to do some heavy lifting, LinkedIn can be a great B2B tool. Where Your Target Industries Live: Most businesses have a LinkedIn page as a matter of course, both as an SEO landmark and a tool for hiring new staff. The more office-centric your target industries, the more likely you’ll find them here. What Content You’ll Need: You’ll want to provide more long-form writing here, either by posting directly to LinkedIn via the Pulse, or using posts to backlink to your blogs and pages. Platform Strengths: LinkedIn excels at networking, and has tools focused on B2B. It can tell you who looks at your page and posts, what industries, levels of seniority they have, and more. Some of their expanded tools are behind paywalls: it’ll be up to you to decide if it’s worth the money. Type of Engagement: As mentioned in my previous blog, B2B with LinkedIn: The Basics, getting your employees – especially your sales team – involved can be a great tool for finding and networking with clients, with premium tools giving you an edge. If you’re interested in learning more about how to get into social media, especially as an established brand, Vision Advertising can help. We’re specialists when it comes to online branding and social media. Contact us today to start the discussion and find out what marketing plan is right for you. We’re also a full-service marketing agency, specializing in comprehensive internet marketing – from websites to social media and everything in-between, to help you not only succeed but thrive.